During week two of the New Year, more than 13,400 Americans signed their name to a TFP Student Action petition, urging Georgetown University -- a Catholic institution -- not to recognize a pro-abortion club, Medical Students for Choice, which was featured on the university's web site. Today, the voice for moral values won. 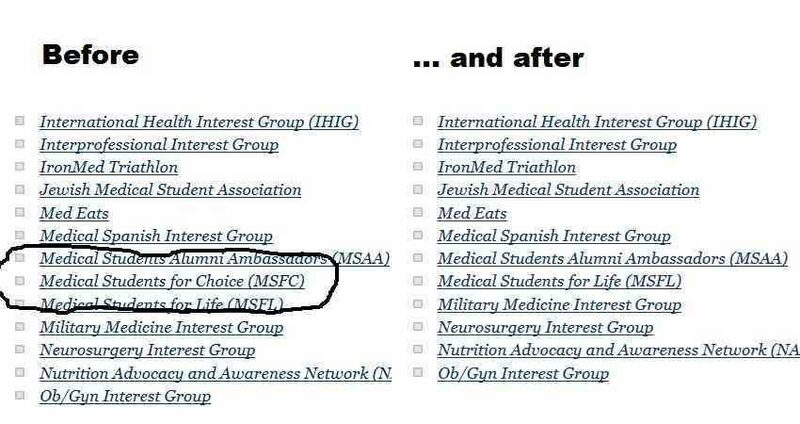 Medical Students for Choice is no longer listed as a club at Georgetown University. A victory was achieved. Medical Students for Choice (MSFC) and its many affiliates describe their mission as “creating tomorrow’s abortion providers.” Not only do they engage in high profile pro-abortion activism, they also hold public seminars called “papaya workshops” where university students are trained to perform abortions using fruit. At one of these events, there was even a professional abortionist who presented techniques for killing unborn babies at 24 weeks of gestation. The public outcry, however, was far reaching. According a representative for the Washington Archdiocesan Office of Life, references to MSFC were promptly removed from the Georgetown web site after the issue was brought to their attention. This explains why those who have recently attempted to access the list of clubs have been unable to see any mention of the group (although archives can be accessed here). Aside from the immediate success of having public references to this organization removed (although it remains to be seen whether their activities at GU will diminish), the positive outcome is representative of something larger. It’s proof that when pro-lifers rally together and take action, they win. Every day the strength of the American pro-life movement is growing and subsequently, public opinion is shifting. Now is not the time to become complacent, but to boldly move forward into the future so that the sin of abortion is finally regarded as it should be: Unthinkable.